Ramen's one of my favourite comfort foods and I've been addicted to Bantam King's Miso Ramen since I tried it last year. Bantam King in Washington D.C. Located close to Chinatown in a space that was previously occupied by Burger King, Bantam King is one of three restaurants by the Daikaya Group which also runs other successful concepts such as Daikaya Ramen and Izakaya and Haikan. 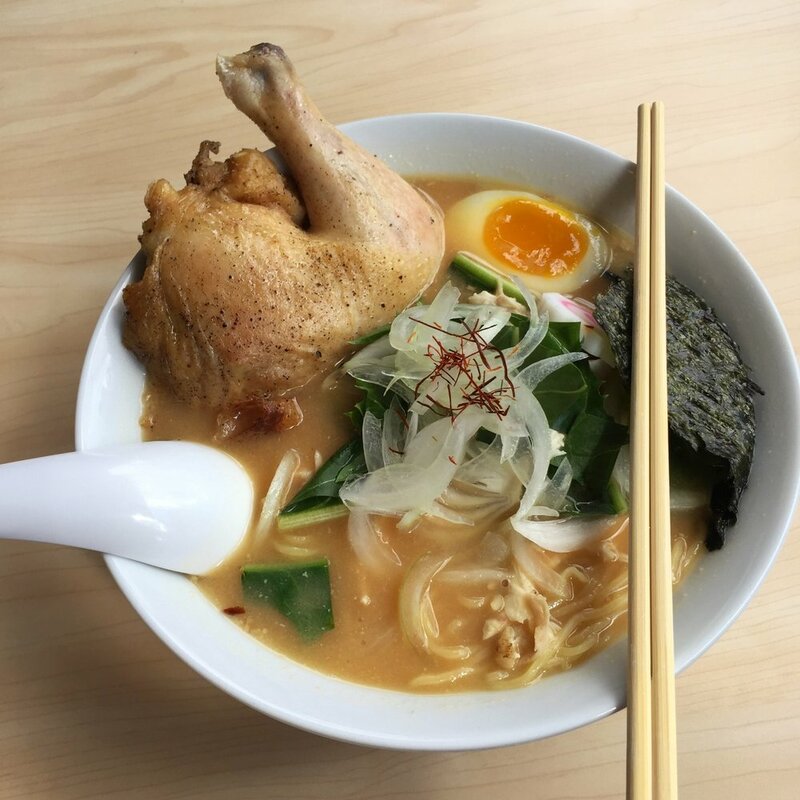 Amidst a plethora of ramen bars in the Washington D.C. area that serve collagen-rich tonkotsu (pork bone soup) ramen, Bantam King's the only one to specialize in chicken ramen and fried chicken. Having eaten there a few times, I can see why this casual restaurant is listed on Washingtonian's 100 very best restaurants in 2017. Bantam King has a small menu with 4 types of ramen (shoyu, miso, spicy miso and shoyu chintan), some side dishes and a fried chicken platter. I've always been a fan of creamy tonkotsu broths but since trying the Miso Paitan Chicken Ramen (USD 12.50) here, I've stopped craving tonkotsu ramen. Topped with dandelion greens, shredded chicken, nori (seaweed), nitamago (flavoured lava egg), naruto (Japanese fishcake) and chili threads, the luscious paitan (collagen-rich) broth was well-rounded, and an umami bomb that's good to the last drop. Way tastier than the shoyu chintan, the miso paitan ramen is a Must-Try! During my first visit, I had a side of roasted chicken quarter (USD 3.50) which was served in the same bowl along with a plate so I could fish the chicken thigh out to enjoy the crisp chicken skin. The roasted chicken seemed bland after savouring the flavourful broth. The shredded chicken that came with the ramen fared better as the meat had absorbed the savoury goodness of the broth. I suggest skipping the roasted chicken quarter and indulging in the fried chicken plate! My husband had the Fried Chicken Plate (USD 12), an"East meets South" platter of Nashville-style hot chicken with Chinese flavours, white bread to absorb the jus and steamed rice. The fried chicken was delectably juicy and tasty. We loved the crunchy crust! I thought it was a lot better than the dry fried chicken I had at Clinton Street Baking Company in New York City and Singapore. However, the star of this platter was the bowl of steamed rice that had been drizzled with chicken drippings and a flavourful but not excessively salty shoyu before being topped with a slab of cool butter and scallions. We mixed the butter in for a sumptuous bowl of calorie-laden goodness that had us finishing every single grain of rice in that bowl. The Fried Chicken Plate and rice with chicken drippings are a Must-Try! PS: The rice with chicken drippings is available as a side order at USD 2.50 per bowl.